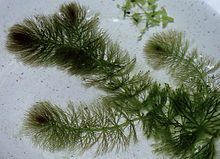 Ceratophyllum is a genus of flowering plants, commonly found in ponds, marshes, and quiet streams in tropical and in temperate regions. Ceratophyllum grows completely submerged, usually, though not always, floating on the surface, and does not tolerate drought. The plant stems can reach 1–3 m in length. At intervals along nodes of the stem they produce rings of bright green leaves, which are narrow and often much-branched. The forked leaves are brittle and stiff to the touch in some species, softer in others.